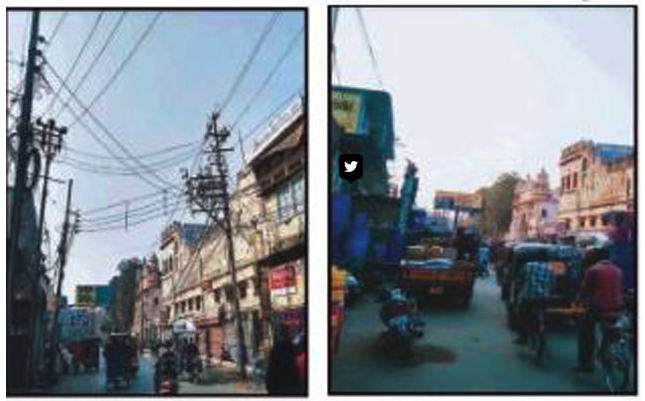 The sight of overhead electricity cables dangerously dangling and criss-crossing in residential areas, in narrow bylanes of densely packed mohallas, is something most residents of UP and other states of Bharat have gotten used to over the years. The going joke was that as electricity was so rare in these parts, these cables were nothing better than clotheslines – and that joke actually became a reality for the hapless residents of UP. But now, things are finally beginning to turn, slowly but surely. While it is just the beginning, the challenging work of replacing overhead power cables with underground lines has been completed in the holy city of Varanasi, Times of India (TOI) has reported. The work of laying these underground cables was completed in two years by state-owned electric utilities company Powergrid as part of an integrated power development scheme (IPDS) project. The underground lines were laid over a 16 sq-km area, for 50,000 consumers through the serpentine lanes and congested markets in Varanasi, one of the world’s oldest cities. “Former Union minister of state for power and coal Piyush Goyal announced the Rs 432-crore project for underground cabling work under IPDS for Varanasi in June 2015. Prime Minister Narendra Modi launched the Rs 45,000-crore IPDS for the country in Varanasi in September 2015. The pilot project was rolled out in Kabir Nagar and Ansarabad. Work started in December 2015, and Goyal visited regularly to monitor the project and said it would be completed in a year though it had a two-year deadline. “Major differences were found in the actual requirement and proposal in the detailed project report,” a Powergrid official said. Since lanes are narrow, very small pedestal boxes had to be installed for switch boxes. The might seem like a matter-of-fact governance task for the yuppie class living in metros, but ask anyone who has lived in UP and they will tell you how big a deal it is. Yes, it is just a beginning and Varanasi probably got special attention being the PM’s own constituency. But this is how development spreads in any region – first, one place prospers and that prosperity slowly spreads to nearby areas. If only the Nehru-Gandhi dynasty had achieved something similar in their fiefdoms of Rae-Barelli and Amethi which have elected them repeatedly since Independence, UP might have gone on a different track. Apart from the IPDS scheme, Modi Government’s determined push to bring electricity to 18,458 un-electrified villages by May 1, 2018 is on track, while the Saubhagya scheme launched last year has an ambitious target of bringing free electricity connections to the 4 crore un-electrified households in the country by Dec 2018. CPM Barbarity in Kerala Crosses All Limits – Is the Union Home Minister Sleeping?